Acquisition Financing Structures are like building a structure for a home. You need a combination of materials such as concrete for the foundation, bricks for the base and wood for the walls. Some materials are versatile and can be used in a variety of applications. Others are single purpose, like concrete, and cannot be repurposed lest the whole structure be put at risk. A good acquisition financing structure works in a similar fashion. It has a strong foundation that will support the combined companies regardless of what rough weather lay ahead. It also has a strong base and weight bearing walls that allow you to expand the business over time. Without the right balance of these elements, the acquisition financing structure is weak. To ensure the structure is built strongly, a Company should hire an M&A Advisor to analyze the risk and valuation of the acquisition. 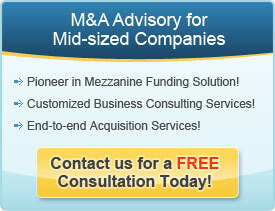 This advisor should be expert in the various types of financing available to fund the acquisition. Each layer of acquisition financing in the structure has a different risk, term, cost and flexibility. The right financing structure should have a lot of long term patient capital as its foundation. This can be either equity investment or mezzanine capital. The structure should also have seller paper and bank loans. While bank loans appear cheaper than equity investment or mezzanine capital, they lack the benefits of term, flexibility and risk tolerance. The best acquisition financing structures are a blend of long term capital and short term capital. They build a safety cushion into the financing structure to ensure the company has enough working capital after the deal is closed. It is rarely the price of the money that determines the success or failure of an acquisition financing structure. But rather, the abundance of money frequently determines success. Due to unpredictability of the business world, conservatism and fiscal restraint are prudent virtues in building your acquisition financing structures.